Spray 5-quart slow cooker with cooking spray. Mix onions, broth, wild rice, carrots, mushrooms and 1 teaspoon of the salt in slow cooker. In large bowl, mix melted butter, remaining 1 teaspoon salt and the pepper. Add chicken; toss to coat. Place chicken on top of rice mixture in slow cooker. Pour any remaining butter mixture over chicken. Cover; cook on Low heat setting 6 to 7 hours or until liquid is absorbed in rice. Position oven rack 4 inches from broiling element. Line rimmed baking pan with foil. Set oven control to broil. Gently transfer chicken to pan, skin side up. Broil 2 to 5 minutes or until skin is crisp. Serve chicken with wild rice mixture, topped with herbs. For extra flavor, use cremini mushrooms in place of plain white buttons. Like a little cheese with your wild rice? Serve rice topped with shredded sharp Cheddar, Gruyère or Parmesan cheese. You may be surprised to learn that wild rice really isn’t rice at all but is actually an aquatic grass seed. Originating primarily from the freshwater area of North America known as the Great Lakes, wild rice is sturdy and absorbs water slowly; for this reason, it requires a longer cooking time than white and brown rice. If slow cooking wild rice makes sense, then pairing it with slow-cooker chicken is a no-brainer. The nutty flavors of wild rice are the perfect complement to tender, savory chicken thighs. 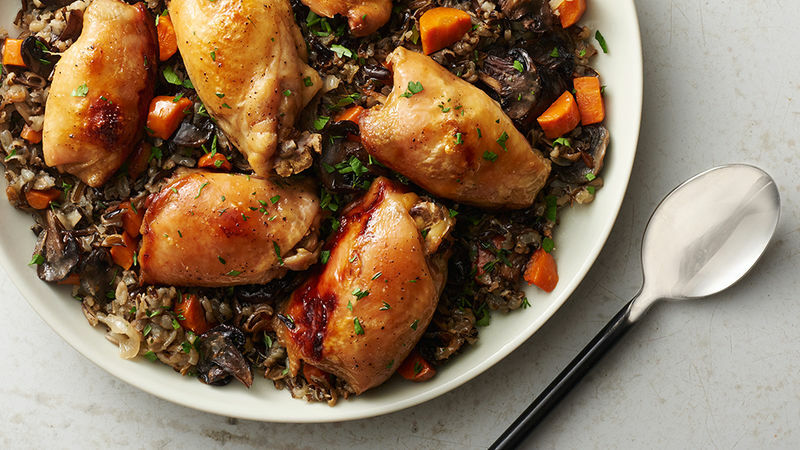 Don’t be surprised if slow-cooker chicken and wild rice becomes your one of your favorite chicken dinners although our other chicken recipes are equally delicious and totally worth making.